Apex supplies all types of production tooling ranging from drill and assembly jigs, drill templates, trim tools, weld fixtures, handling fixtures, cable assemblies, electrical checkout equipment, installation tools, hoisting tools, and proof loading systems. Our staff has extensive experience in design and manufacture of custom composite/ laminate tooling. Laser tracker tools are used at our Decatur manufacturing operation for precision location and alignment. Floor Assembly Jig (FAJ) with Drill Bars – Fabricated steel structure with approximately (24) 5-axis machined Drill Bars. Drill bars are independently hinged every for easy location of end product. Simi-Automatic Rotation Assembly Fixture provides several pre-set postions with lift up to 10 feet and 360 degrees of rotation. User Friendly computer controlled system with hand held pendant. Laser aligned rails allows this tool to be easily be pushed into position without mechanical intervention. The span of the two dollies ranges from 20-feet to 65-feet. The controls lift and rotate the panel within 0.035° of each other. Portable Class 1, Division 2 explosion proof environment. 360° of rotation with two pivot points. 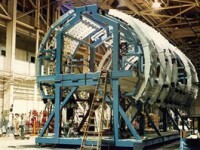 A large, remotely controlled, motor-driven, mounting fixture used to attach special pumps on a heavy booster rocket engine was manufactured by Apex. All sizes of handling dollies have been manufactured or designed and built by our staff. Apex’s experience ranges from large, automated hoisting systems to simple lifting fixtures. Some of the larger projects are represented by a rail mounted, hydraulically operated tool for moving large assemblies into a paint cell and a radio controlled, hoisting attachment for a crane hook with remote control of the X and Y axis motion. Connecting under the crane hook, Apex designs and fabricates proof load fixtures to load test both large and small structures. Apex facilities are performing this work on both coasts of the US, in Anaheim, California and Decatur, Alabama.